A huge congratulations go to St Laurence’s Catholic Primary School for achieving the Platinum School Games Mark Award for 2016-2017. The Platinum Award was launched earlier this year as an extension of the School Games Mark to reward schools who have maintained consistently high standards with their school sport provision. As part of the extended application the eligible candidates, who had achieved five successive gold awards, were asked to submit a detailed case study along with a supporting paragraph from their School Games Organiser (SGO). 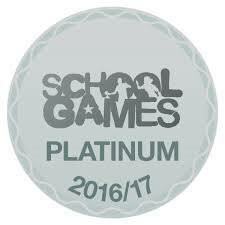 Our winners will be exempt from next year’s School Games Mark award process and will automatically receive the Platinum Award again in 2018. They will also receive a special plaque to commemorate their achievement and will be entered into a draw to win a surprise presentation visit from a celebrity guest. 104 schools achieved this award across the country, it is a fantastic achievement. Well done!